Outfit Generic is a boutique hospitality group based in San Francisco, California. WILLIAM WERNER serves as Outfit Generic’s Executive Chef and Chief Creative Officer and is responsible for the creation of the group’s strategic vision and concepts, including menu development and overall look and feel. With more than a decade of experience in pastry at some of the most highly regarded restaurants and hotels, he has risen rapidly among the nation’s top pastry chefs. Recently named San Francisco Magazine’s “2014 Best Pastry Chef,” Plate Magazine’s “2014 30 Chefs to Watch,” Star Chefs’ “2013 Rising Star Artisan,” and a James Beard Foundation “Outstanding Pastry Chef” nominee, William also serves as a Valrhona chef ambassador, leading professional culinary demonstrations around the US and in Canada. JOSH CHEN is Outfit Generic’s Chief Design Officer and collaborates with William Werner on the inspiration, branding, packaging and retail environment for Outfit Generic’s concepts. In 2010, the two worked together on the brand look and feel for Tell Tale Preserve Company, through Chen Design Associates, a creative communications agency in San Francisco. Over the past 20 years, Josh’s work has been featured internationally and has received numerous industry awards, including recognition by the Type Directors Club, Communication Arts, and HOW International Design, amongst others. Named one of 50 “People to Watch” by Graphic Design USA, Josh has written and designed four award-winning books, most recently Archetypes in Branding. LAWRENCE LAI serves as President of Outfit Generic and oversees the operation of the company. Born in Taiwan and with a B. S. in business economics from UCLA, he worked his way up from a knitting floor technician to executive VP at Lafa Knit Corp., an apparel manufacturing company with annual revenue of $10 million. With practical knowledge in quality assurance and procedure standardization, Lawrence brings more than fifteen years of experience in operation to the group. ANN LEE is Outfit Generic’s Chief Financial Officer. Born in Taiwan, with a B.S. in mathematics from the University of California, Davis, and an MBA in finance from California State University, she has worked as a loan officer of General Bank, specializing in commercial loans, and as treasurer then CFO of Lafa Knit Corp. Ann brings more than fifteen years of experience in accounting, finance and human resources to the group. 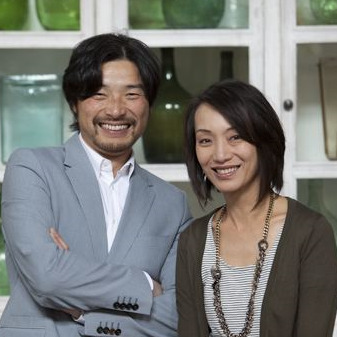 In 2009, Lawrence and Ann launched Naivetea to bring high-quality Taiwanese tea and fine porcelain tea ware to the U.S.